With more than a half century of home games played on the green and gold field, Lambeau Field is the oldest continually operating NFL stadium. Located in Green Bay, Wisconsin, the home of the Green Bay Packers opened its doors in 1957 as City Stadium. Locally known as New City Stadium, since it replaced a previously named City Stadium, it was eight years before the 1965 renaming in memory of Packers founder Curly Lambeau. 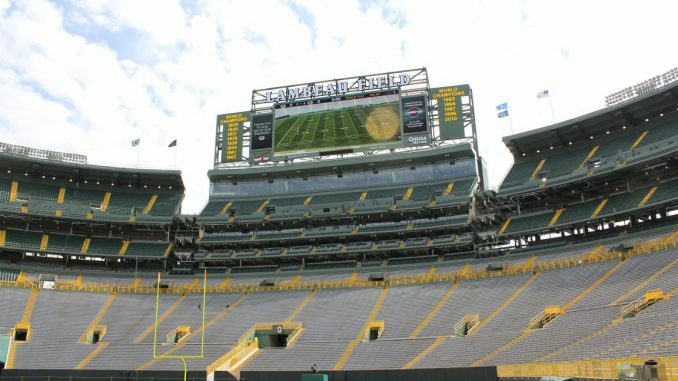 There have been numerous renovations to the stadium throughout its life, and while it is an old stadium surrounded with Green Bay history it has all of the modern conveniences football fans look for. With a maximum capacity 81,441, Lambeau Field is also one of the largest stadiums in the NFL and the largest stadium of any kind in Wisconsin. While Lambeau Field is the oldest continually operated stadium in the NFL it is not the oldest. That honor is held by Soldier Field, home of the Chicago Bears. Construction at Soldier Field finished in 1924, but it was not till the 1971 season that the Bears made it their permanent home. In all American sports there are only two teams that have had a longer duration at their home field, the Boston Red Sox started at Fenway Park in 1912 and the Chicago Cubs at Wrigley Field in 1916. The benches at Lambeau Field were made of wood until the 1969 season. The field is a mix of synthetic fibers and Kentucky Bluegrass. There is a 50 foot tall statue of the Lombardi Trophy at the stadium. There is an underground heating system to prevent the field from freezing which comes in handy during the long Green Bay winters. The waiting list for season tickets to Green Bay Packers home games is over 100,000 people long.